Vertex template created by Templateism editorial recently at the end of 2013. Many professional features have been included. It is 100% responsive template which will give awesome looks on every electronic device like, laptop, Ipad, Tablet and Multimedia Screen etc. 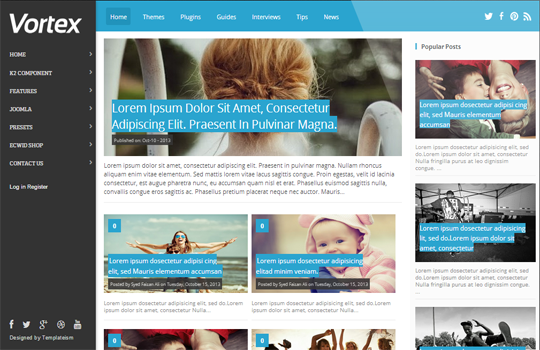 Vcard is yet another premium Blogger template from Templateism gallery. Vcard is made for personal information and official works. Its navigation is purely Coded with Jquery so that not to lower down the loading time. A smartify social sharing buttons added in this template to make its design perfect for both bloggers and webmasters. Geeks Gadget is yet another 3rd highly PRO design template from Templatesim. After releasing this template bundles of downloads were counted in few days which prove its popularity. This template hold professional header, sidebar and footer gadget. Each and every section is coded technically thats why it is one of the fastest loading template. 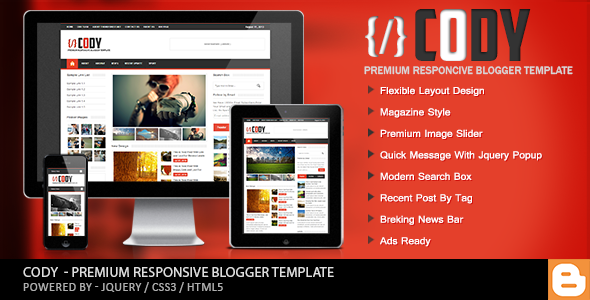 Cody is a Professional Paid template from Themeforest templates gallery. It gives responsive looks on all standard device. However Cody is not a free template to download, If someone want to download its full version then you have to pay at themeforest to get this premium template. 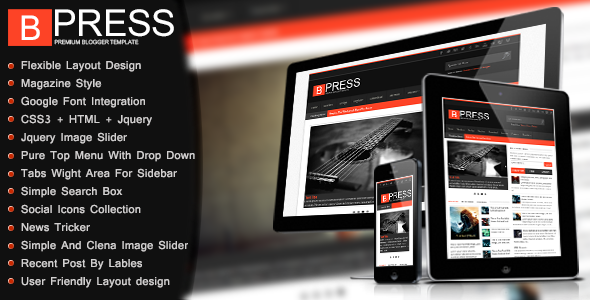 Bpress is yet another blackish responsive blogger template selling at themeforest. Believe me or not, it gives the perfect and similar look on every standard device screen resolution. This template has more than hundered of downloaders and still counting. 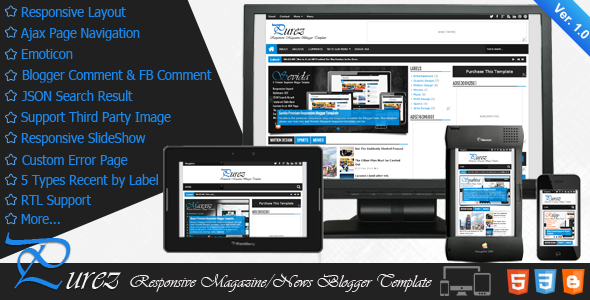 Purez is responsive blogger template having ajax page navigation, Responsive slidshow, Rtl support and holding facebook comments system along with default ones. So if you are eager to bring professionalism in your blogger blog then i would recommended to get this one from themeforest. 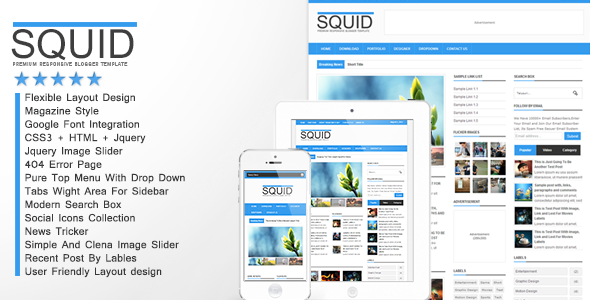 Squid has flexible and magazine style design. It has been integrated google font and Jquery image slideshow. A greenish top menu is designed with drop down functionality and having a modern search box at the side area. This template is designed with two major color white and green combination. To download this one get it from themeforest. Idesigner is several times shared at PBT. Idesigner has highly professional gadgets and one awesome slideshow working on home page. Somewhere it looks like WP template. It has one top premium navigation menu and stylish social sharing gadget at the top of right sidebar. 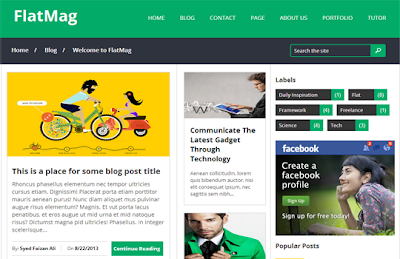 Flatmag is premium and SEO optimized template provided by Templateism. 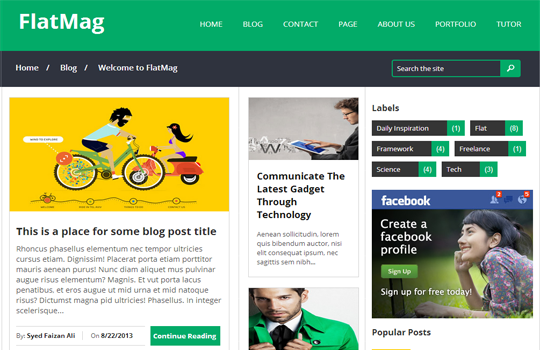 Flatmag is three column blogger template having awesome label gadget. It has many prominent features then the rest of all templates. This template is suited for both business and personal information. 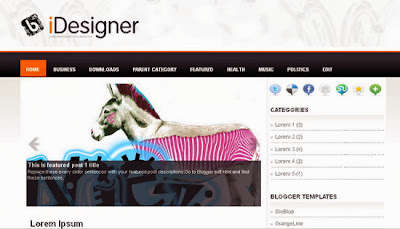 A fastest and SEO optimized premium blogger template. 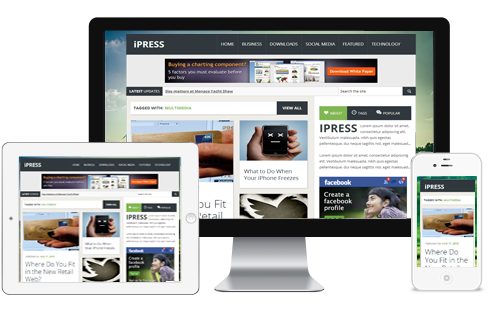 Ipress is the last and final responsive template from Templateism. This template is specially designed for business marketers as well as for blogging activities. A high stylized and prominent gadgets added in this template to give a professional looks. It holds two columns for posts and one right side for adding gadgets. 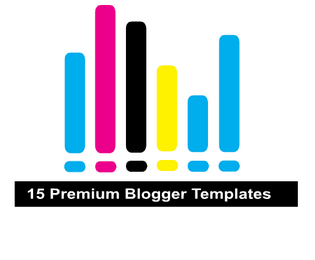 Guys this was a tiny collection of top 10 premium blogger templates of the year 2014. We hope you would like this tutorial. PBT will bring more templates in future tutorial just stay tuned with us. If you anyone face any problem in implementation just post your query in the below comment section rely will back soon within 24 hours. Thanks. 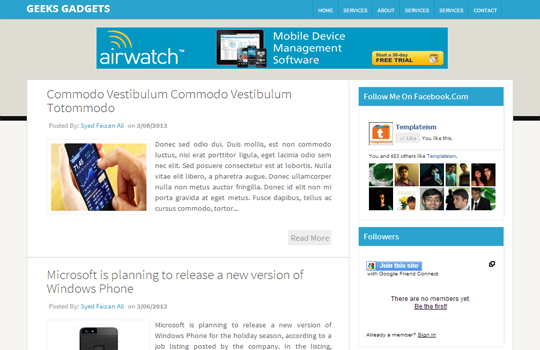 I will soon publish thats on my next templates blog...just stay tuned with us.. Yes buddy...Vcard is one the professional and premium blogger template of the year 2014..
ur new theme lookin very nice. That's great bro, thanks for this informative article and by the way new blogger look is awesome. Thanks..Yes buddy we upgraded this to professional one...hope you will find a lot on our next mega blog..
Really very nice collection of templates and your new template is also very good looking.. Very Very Good and beautiful Templates.So Nice! thanks kashif for your kindly feedback...we will bring more awesome premium blogger templates in 2014. stay tuned with us...thanks. 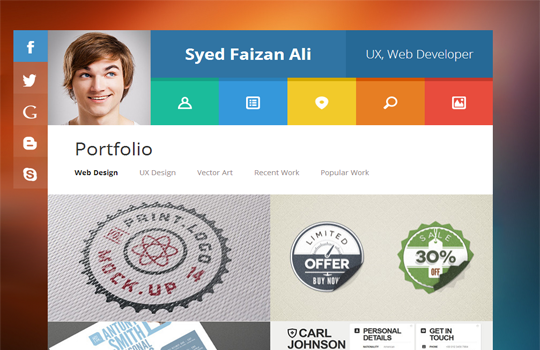 Hi Hafeez, Really great templates collection. If you will publish a post for free templates, You can add this really cool template. Yo Fellas,i Recommended Sevida Template. I think that's one of the best.